The biggest news this morning is that Internet Explorer 8 Beta 2 is out. It's still a developer's preview version, but it seems stable enough for consumers to test. I'll cut to the chase - you can get it here. Internet Explorer is still used by a whopping 73% of internet users, and 47% of Tech Digest readers (42% Firefox, 7% Safari, 4% other, in case you were wondering). Why do so many people use it? Well, almost certainly because it comes as standard on Windows machines. Many people can't be bothered to change the default. At one point in 2003, IE had 95% market share. A little history, then. IE6, released in 2001, was a big pile of awful. It was insecure and heavily criticised, which let Firefox (and Apple, too) take quite a big chunk of market share. IE7 was playing catchup, adding tabs and better security, but IE8 looks game-changing, and a strong challenger for Firefox 3.0. Click over the jump to find out why. Firstly, Smartscreen Filter. Smartscreen filter is basically a virus scanner for websites. 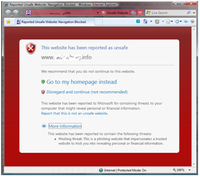 Any time you go to a dodgy site, RED ALERT! It'll allow you to continue, or give you the option to go to your homepage instead. You can also on-demand scan individual sites, much like you'd scan individual files with a virus scanner, and if you try to download dodgy files when a download site has been reported, it'll alert you too. Secondly, tabs are "loosely coupled". That means that each page in each tab is isolated from the others, and from the main browser. A single dodgy page won't crash the browser, or any of your other tabs. It'll just sit there crashing on its own while you carry on doing whatever you like in your other tabs. While we're talking about tabs, it seems only fair to discuss some of the more navigational aspects of IE8. Microsoft are talking a lot about the "flow" of navigation, and not interrupting that, and the tabs behaviour backs that up. It's really easy to bring back tabs you've closed. Tabs are colour-coded, too - depending on where the site has come from. In the image above links in the search results page are grouped together and colored differently from the headlines the user followed off another page, which are different from links the user followed off other pages. Oh, and there's now a big X button on each tab, which is a Firefox feature that I was missing. A snazzy word for "plugins" really. Accelerators were formerly known as "Activities", and they cut out a bit of the copy and pasting that's so endemic in current browsing habits. Instead of the "select, copy, new tab, go to site, paste" routine that you'd invoke if you were trying to look up an address on Google Maps, you can simply select the address and right-click to bring up a map on the site of your choice. Plenty of different accelerators are already available for a bunch of big sites, and I suspect they're not too hard to code if you want to make one yourself. 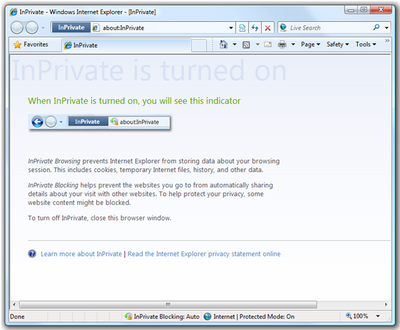 IE8 will feature a mode called "InPrivate" which will let you browse without recording anything. New cookies don't get stored, history doesn't get recorded, temporary internet files are deleted when the window is closed, form data, passwords, and addresses aren't stored, and nor are search queries. Brilliant. Just the thing for a night in, manipulating the mango. Oh, and while we're talking about cookies and temporary internet files, there's a lovely feature that lets you keep cookies for websites that are in your "Favourites" while deleting other ones. This is just a quality-of-life feature, but it's the little (almost Mac-like, dare I say it) touches like this that make me really excited about IE8's release. IE8 is enormously standards-compliant, supporting CSS2.1, and Microsoft have submitted a tonne of test cases to the W3C to help increase interoperability between browsers. They've also included a "compatibility view" button, much like the Windows Vista's own compatibility mode, that'll let you view a page as if it were rendered in IE7. Some websites might be slow to adapt, after all! Even though this is only an early beta, I'm already very impressed. This really ups the ante on what a browser can be, and I think it genuinely offers plenty of new ways of interacting with the internet. It's faster, better and more secure. Please refer here for more details by Roger Halbheer.